What do you really want when you visit a new hunting lodge? I have that discussion with lodge owners regularly over a pool table, beer, or in the kitchen at great places from South Dakota to the Pacific Northwest. So, I asked you. And them. And not surprisingly, based on your answers a lot of the places I like, you like. They love dogs and take special care of them. The cover is lush, the birds wild-crazy-hard flying. And clean? These places are clean and comfortable. They offer privacy when you want it, fellowship when you don’t. We know; we’ve been there. And for my fellow citizens of the Upland Nation, I’ve asked them to offer exclusive offers, big savings, and some nice added values to your hunting experience. Beginning this fall, those deals will change monthly, so there will always be something new, different, and sure to make your hunting more fun and a better value … as long as you jump on them fast. You’ll be able to warm up on a clays course, then venture into some of the most well-managed habitat in the country. You’ll have room to roam, and chase both wild birds, and their close cousins … all hard-flying and beautiful in the hand and delicious on the table. Check back often – exclusive deals and savings change regularly starting in September. Ron, Ken and Beverly, Sara and Jake, Ryan, Ron and Michael have joined forces to offer members of the Upland Nation excellent value and exclusive, screamin’ deals on a variety of hunting-lodging packages. Like hunting, every lodge is different, so you’ll want to shop for the right fit for you (and your friends and family – most offers will encourage you to bring someone hunting). But they’re all special, operated by the owners (my friends), and dedicated to providing you a great time and excellent value for your dollar. I guarantee it. There’s a price and package for everyone somewhere on our list of Upland Nation Preferred Lodges! Check in regularly, or subscribe to this page for monthly offers from the Upland Nation Preferred Lodges. Our first exclusive offers are ready for your consideration! Go to the individual lodge pages by clicking on their logos below for details and BIG savings, freebies and other great values. Ken and Bev Corbet welcome you with down-home hospitality amid history and incredible habitat, near Topeka, KS. Jake and Sara Dusek’s African-style adventure near Havre, MT. The Rivett family, ably assisted by Michael Helm, have created a sportsman’s paradise near Aberdeen, SD. Ron Olmstead’s laid-back approach belies exciting bird hunting amid rolling hills near Spokane, WA. Scott, my husband caught the last few minutes of one of the shows and we’re trying to figure out the location. It was a newer lodge with clay shooting and flyfishing options. Do you know which of the locations this was at? We’re trying to plan for an anniversary shoot and he really liked what he saw (all 2 minutes worth) on the episode. Nope. But maybe someone else here does. Post on my Facebook pages as well. Good luck. just got my new tri-tronics classic 70 EXP for up to six dogs and i can’t wait to use it and get two more setters sense i have room for two more on this system!!!!!!!!! I wonder if my wife would go for rationale like that? never know tell you try, mine didn’t seam to mind when i asked i got told if i really wanted two more she’d go look with me. I used it today and i absolutely love it.!!!!! it can control 6 dogs, 6 levels of stimulation, a tone setting, an accessory setting that controls beepers for each collar separately man i can’t say enough Tri-Tronics you’ve done it again I’m like a kid on Christmas!!!!!!!!!!! You are more than welcome to come to northern Maine and hunt grouse with me at my sporting camps. WadleighMountainCamps.com . Check it out.. I have a great pair of english pointers that would love to point for you on some untouched covers here in Maine. Call anytime, were not on the pavement up here, but have all amenities as like home. Thanks and watch out – I may take you up on that offer. Anytime scott. Feel free to call, we can chat. I wouldnt mind getting out of maine for a week and watching other people work there dogs. Have you herd of Indian Creek Kennels in NJ?? I picked up 2 rockstar pointers from Garry, he does a GREAT job. Thanks Joel. Don’t know Indian Creek Kennels, but glad the dogs are working out. Good luck. i was reading some of the post where we can watch your show online, if you wanna do a show with grouse you really should come to Preston, Idaho where i live i had a buddy up here last year 2011 hunting and in one field we had over 40 grouse and like i said before i would be glad and honered to take you with me it could be a grouse/pheasant hunt you could get some awsome filming in and idaho dose the 3 day permit for $36 so if you think you would like to let me know and ill make the arrangements with the landowners!!! o and the gun shy dog hasn’t been as hard as i thought, we’ve been out every day playing and ive been letting her chace twittie birds as they come outta the grass and today my girl scotch went on point (ill post a pic on face book for ya) and cooking was working her way over to scotch and about 10-15 feet away from cookie the bird scotch was pointing flushed and cookie started chacing and i slapped my hands as hard as i could 3 time the first she kinda flinched but kept on the bird the second not as big of flicnch but agian kept on the bird the 3 didn’t even bother her so ill keep going with that tell the 9th when the blank gun and blanks get here and will move forward from there. thanks scott!!!!!!!!!!!!!!!!!!!!!! Glad it’s going so well. Keep us all posted. Sounds like great grouse hunting up there. I’ll let you know if we’re headed that way. Thanks for the invitation. Scott, i went to a lodge near paris texas named High Brass Hunting Preserve and i loved it. The food was great the guides were very good at what they did. You should look into hunting there sometime. They offer pheasent, quail, chuckar, or any combination. Its a great lodge if you are looking for one. Thanks. I’ll add them to my wish list. Thanks Scott! I’ll get ahold of a trainer and keep u informed. Also if you make it this way I have a few private properties I hunt and I’d be glad and honored to take you along.!! Thanks Trevor and good luck. Scott, I contacted Chris at Cove MT Kennels in Cubbic ID. He said working a dog through being gun shy is possible it’s just a slow process you have to start with a bird and get the dogs bird drive good and strong and then move to a bird and childs cap gun tell they get used to it then slowly progess to slightly bigger guns each time they become okay with the gun your using. Just thought i’d let you know incase you get asked the question i asked. I’ll keep you informed on the progress of my dog!! Looks good! That’s pretty much how you’d introduce a dog to gun fire. Hope all goes well. Scott I also have your show on dvr so I can keep going back and watching it and learning I own 4 English setters from champion lines 2 females and two males and watching your show has helped me train them so I’d like to say thanks and I’m always looking forward to the next show.!!!! I’m wanting to take my dogs to some ranches to hunt but not sure which or where I’m from Franklin id and would like to find some good ranches around here to go to do you know of any or where or how I could find some on the internet? Thanks again Scott. I love the show!!!!!!! Thanks Trevor. When you say ranch – do you mean hunting lodge-type ranch? As far as other properties, probably no can do. But depending on how far you are willing to travel, there are lots of hunting operations. I like Flying B near Kamiah, also little Canyon Shooting outside of Peck. Cross the river into Oregon and you’ll find Flying Double F near Vale. We’ve made shows at all three and I’d go back any time. Yes I mentioned ranches like you go to thanks for the info ill be going to the ones you mentioned. Another thing I’ve been wondering is there any way to get a dog not to be gun shy I just picked up a 5 year old setter and the Guy said she was gun shy so I was gunna use her for breeding but I’d really love to hunt her also if you have any suggestions I’d love to use them? As I only breed my dogs when people tell me they want a pup from my dogs I am a hunter first breeder second. Thanks again Scott!!!!!!! 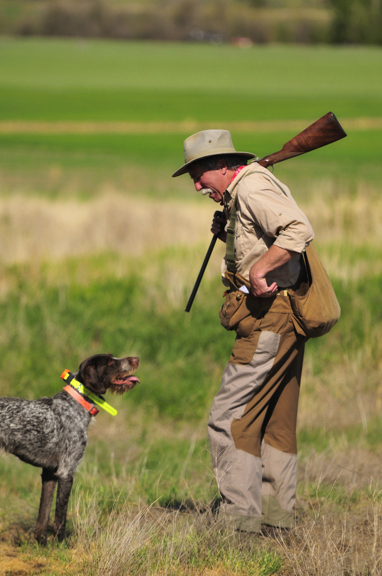 Good luck – on the trips and with the gun shy dog. That is a long road; I’d talk to a proven professional before trying to reverse your new setter’s gunshyness. Keep me posted. Jason, generally I would steer away from “book now” offers at the show. Investigate each lodge by asking for references before putting down hard-earned money. Banking on public land in any of those states means hoping nobody’s hunted it before you got there, or risk sharing it with a crowd. If you’re going to travel that far, why not ensure you get Callie and Hunter into plenty of birds? Many lodges will offer access to wild and released birds, and can even steer you to public land nearby. Three I recommend are Rivett Refuge Preserve in South Dakota, Ravenwood Lodge in Kansas, and Pheasant Bonanza in Nebraska. I’ve made shows at all three and can’t wait to get back. Tell them I sent you! Ask about what is included in the price (how many meals, bird cleaning, transportation, beer). And, how many birds you can shoot for your fee. Ask how rooms are divvied – shared with someone or single? I’d also make sure they understand you have pointing dogs and want to hunt them, not a big line of drivers with blockers at the end of a field as is common in the Dakotas. Find out where your dogs will be sleeping, how many hunters per guide and whether tips are included in your rate. Have a great time! Do you know of any good clubs in Nebraska? Yes. Go to Pheasant Bonanza. We did. You’ll see the results next season. Know of a good place to hunt quail in Kentucky? Wish I did! Good luck. Scott, I’m a regular viewer of your show and enjoy it. Just wondering if you were ever going to head east and do a grouse/woodcock show? Thanks Mike. Been working on a grouse/woodcock show but just haven’t made a good connection yet. Stay tuned. At least we’ve gotten to bobwhite country! Great show…I have a GSP and Lab that would love to join you. You’ll have to sub for me, Rick. Take them out often. Thanks for the compliments.